This morning I discovered a partially disassembled iMac abandoned in my building's dumpster. It should come as no surprise that E-waste is an increasingly important issue, and is terrible for the environment. The individual who left this computer for trash acted extremely irresponsibly. What's even more frustrating is that Apple makes it trivially simple to recycle their products. It pains me to think of all the components of a computer leaching into a landfill, not to mention the parts that can be recycled, so I took it upon myself to remove the iMac from the garbage (thankfully it wasn't full). The nearest Apple store is only a 15 minute drive, so I gathered the disassembled pieces and carried it into the store. 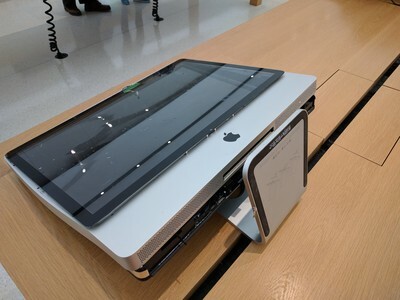 When I was greeted by the Apple Genius at the front of the store, I coyly asked whether they thought they could fix my computer. After a brief pause, he smiled. Several employees came over to inspect the mangled specimen I had retrieved. We posed theories as to why the owner may have bent and torn into the case when the only missing components were the RAM sticks which are easily accessible. I was thanked for rescuing the computer from the trash and we made a few jokes at the unknown owner's expense. My good deed done for the day was done, and at least one less computer went to a landfill.